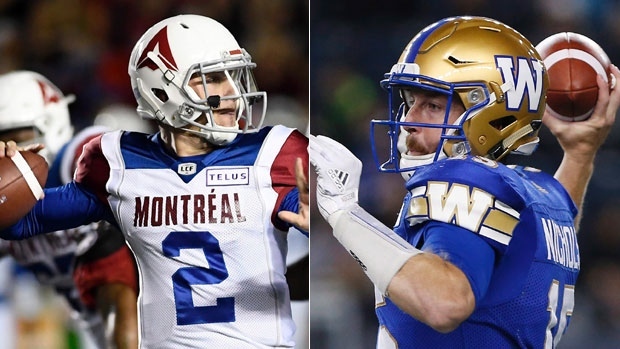 While quarterback matchups are the subplot of every football game, rarely is the drama more intriguing than it is around tonight’s game between the Montreal Alouettes and Winnipeg Blue Bombers (live on TSN 1,3 and 4 at 8 p.m. ET) – even though the circumstances surrounding Johnny Manziel and Matt Nichols couldn’t be more different. On the one hand you have Nichols, a 31-year-old veteran in his seventh CFL season and his third with a Blue Bomber team that is under pressure to step up in class this season to be among the elite teams in the CFL. He entered the season as the no. 1 quarterback for the Blue Bombers, but his play over the past month has slipped sharply, uncharacteristically turning the ball over and making poor decisions. When he was pulled at halftime of the Banjo Bowl two weeks ago in favour of rookie Chris Streveler, his confidence appeared to be gone. Winnipeg is a football-mad market and the fans are demanding answers. Nichols has never been a dynamic player, so his game is built on consistency and avoiding mistakes. He’s trying to hang onto his job and avoid what could be a turning point in his career. Contrast that to the 25-year-old Manziel in Montreal, the big-name former NFL first-round draft pick who – for various reasons – has struggled to establish himself the course of his first CFL season. After sitting behind Jeremiah Masoli in Hamilton for the first several weeks of the season, Manziel was traded to Montreal and started back-to-back games for the Alouettes. He was then sidelined with a concussion, an injury that cost him his job for two games after he’d been cleared to return. The Alouettes are still clinging to slim playoff hopes, but this is a team just hoping to improve during the final third of the season and establish their no. 1 quarterback for next season. Montreal fans need a reason to care about this franchise. Manziel can be a dynamic player, a game-breaker who has fans on the edge of their seats with his combination of athleticism and instinct for the game. He is trying to prove he can be a starter in the CFL for what could be a turning point in his career. There’s no doubt it’s Nichols who is under more pressure tonight, playing at home where he’s heard the boo birds in recent games, because the Blue Bombers simply can wait for him to rediscover himself. Securing the football has always been a point of pride for Nichols, who had just eight interceptions in 579 pass attempts last season. By comparison, he’s thrown the same number in just 75 pass attempts the past four weeks – all Winnipeg losses. The Blue Bombers were once 5-3, which included a pair of narrow losses to Edmonton and B.C. during the first few weeks of the schedule. Now they are 5-7, last in the West Division and just two games ahead of both Toronto and Montreal for a crossover playoff berth. Their final five games include two against Edmonton and one each against Calgary and Saskatchewan, with their only eastern matchup against first-place Ottawa. If Nichols can’t give the Blue Bombers more consistency they’ll have no choice but to go to Streveler, who has provided energy and athleticism when he’s come into games, either as in relief a week ago or as part of a designed package. Montreal, on the other hand, has to be patient, even though its coaching staff and management may be on borrowed time without a late-season turnaround. Less than two months ago, the Als traded a huge haul for Manziel to be their starter and lead them out of the quarterback wilderness. There has been nothing in his play since that time to suggest he can’t be that player. And while they may have felt it necessary to ride the hot hand of Antonio Pipkin until he crashed last week against B.C., it was inevitable they would have to answer the question of whether they remain committed to Manziel, as they said they were back at the time of the trade. He’s not wired to be a backup, so it's hard to imagine Montreal bringing him back in any capacity besides a starter next season, especially with a contract that pays him a base of $295,000. So it behooves the Als to use the final third of the season to determine if they can hitch their wagon to him beyond this season or not. Nichols and the Bombers, who were 9-3 after 12 games a year ago, can’t afford to wait. These are two quarterbacks under a lot of pressure, but one with a lot less time to figure things out than the other. Undoubtedly the optics of Hamilton returner Shakeir Ryan being tackled by Calgary’s Jameer Thurman grabbing him by his hair aren’t good for the CFL and, as a legal play, it seems to fly in the face of efforts to make the game safer. But while the matter is likely to come up for discussion this off-season, the league isn’t rushing to make a mid-season intervention. “It comes up every couple of years … it’s technically part of the uniform so you can’t hold with it, but when it comes to tackling a ball carrier it’s not a penalty,” said CFL director of officiating Darren Hackwood. What the league seems to be saying is that players who choose to grow their hair long do so at their own risk. It was just over a year ago that the CFL and its players’ association announced an agreement to do away with padded practices beyond training camp, taking away the one day per week that teams ordinarily practised with contact. While practising in pads isn’t so much the source of injuries, the thinking is a reduction in players banging in practice would have a positive effect over the length of their careers. The league and the PA are still assessing data from the past 12 months, although both acknowledge it might not reveal anything significant. What is significant is the amount of pushback that’s come from coaches, GMs and even players who say that not being able to practice in pads has hurt the ability to develop and evaluate players. The league allows players on a practice roster to have 15 snaps per week in full pads. Players returning from injury, who need to get into game shape, are afforded the same. But some actually feel not practising at all in pads could be leading to more injuries since players aren’t able to practice technique or simply aren't conditioned for contact when they step on the field into live action. It will be interesting to see how hard the teams are willing to argue this issue in the off-season and whether the league and its players’ association would consider any movement. Getting rid of padded practices, while done in the name of long-term health of the players, was also a chip the league gave the players in exchange for lengthening the season to 21 weeks to avoid teams having to play a condensed number of games in short periods of time. One thing that has defined the Calgary Stampeders in recent season is their ability to overcome a series of injuries at a particular position group. In past years that’s involved the offensive or defensive lines. This year it’s been their receivers. Despite playing without Eric Rogers and Kamar Jorden, and then losing DaVaris Daniels early in their contest last weekend against Hamilton, Calgary’s Bo Levi Mitchell still managed to pass for 270 yards in a win over the Tiger-Cats. Speaking of Mitchell, one year after he was limited by injuries, the Calgary quarterback is playing more of a big-arm game this season. He's on pace for a career high in passing yardage and has already thrown more touchdown passes than he did all of last season. The Stamps lead the league in completions of more than 30 yards and Mitchell has attempted more passes over 20 yards than any quarterback in the league. The Saskatchewan Roughriders are 4-1 in their last five games, averaging more than 30 points a game over the stretch. That doesn’t sound much like a team with an offence in crisis, but in this case looks can be deceiving. Though the Roughriders are 7-5 and have scored exactly as many points as they’ve surrendered this season, an unusually large percentage of those points have been scored on special teams or defence. In fact, the Roughriders have had just 15 touchdowns on offence this season, the fewest of any team in the CFL, and have had a remarkable 12 touchdowns on returns. Over their recent 4-1 string, Riders quarterbacks threw two more interceptions than touchdowns and completed only 58 per cent of their passes. Logic would say that eventually the rate at which Saskatchewan’s defence and special teams have scored this season is bound to decline, meaning the offence is going to have to be more productive and consistent, especially when it comes to throwing the football. A good place to start would be this weekend against Toronto, whose defence enters the game having allowed 78 points in back-to-back losses to the Hamilton Tiger-Cats. The Argos also allowed Montreal to score a season-high 25 in the game previous to the Hamilton series.